There aren't many design firms in Toronto that can be considered household names, but PARTISANS may soon make the list. The four-year-old company has been making headlines for projects as diverse as their ambitious and sensuous design of Grant van Gameren's Bar Raval, to the highly anticipated Union Station Revitalization Project. The group is known for pushing boundaries, with their mandate stating that they hope to highlight the counter narrative of spaces with design that unseats expectations and creates conditions for transformative experiences. 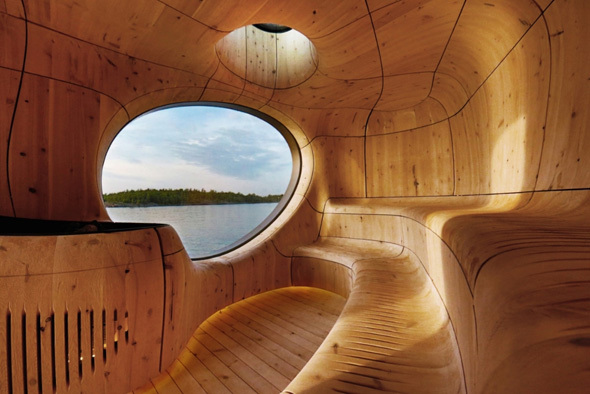 Aside from landing such major civil projects so soon into their career, the firm has also been receiving a fair share of accolades - they're the winners of the 2015 OAA award for Best Emerging Practice and Design Excellence, and they've made the short list for the 2015 World Building of the Year with their innovative Grotto sauna. "Architecture firms [in Toronto] tend to build buildings instead of dreams," says Alex Josephson, co-founder of the firm. He tells me that PARTISANS is interested in "much larger, or much broader definitions of how architects work." To Josephson, architects create culture for their city, and "bring a poetic dimension to the space that defines it." So what's their approach to a civic project like Union Station? "We worked on how to turn Union into a destination, rather than just a conduit," Josephson explains, adding, "It's just a statement, but it's a pretty big statement." Josephson says the firm hopes the revitalized station can act as a community hub for the thousands of condo-dwellers expected to move into the ever-expanding number of downtown units. PARTISANS is also engaged in a "just for fun" project, that aimes to satirize the city's condo-development. Wanting to focus on the experience of the pedestrian on the street level, rather than the city's skyline, they developed 365 rhetorical condominium bases. A way for buildings to "misbehave," in a way they're not currently given a chance to. So what's next for the firm? Those eager for more stunning restaurant designs may be disappointed. "To be honest with you, I think there's a limited number of restaurateurs in the city that have the ambitions of the clients we've had," Josephson says. "Grant van Gameren is not your typical chef in Toronto - he was willing to make the investment in the experience. I don't think there are a number of people willing and able to do that here." Nevertheless, PARTISANS is currently working on a project for Janet Zuccarini of Gusto 101 fame, so fans of great interior restaurant design will likely have something to look forward to. Writing by Sarah Nieboda. Photos courtesy Jonathan Friedman / Partisan Projects.